Thermaltake Core V51 mid-tower chassis, a new member of the Core Series, which now comes after the launch of Core V71 and Core V1, retaining the curved metal mesh look and delivering an outstanding cooling performance with the compatibility for the extensive DIY/AIO LCS, and the air cooling units that the series has become so very well known for. Core V51 is an enthusiastâ€™s grade mid-tower that creates unprecedented space for high-end hardware and liquid cooling expansion, supporting the latest E-ATX, ATX, Micro ATX motherboards, and all high-end GPU cards. I love the honeycomb shape of the front grill, especially when you have LED fans in there. It matches our Level 10 M Hybrid mouse & VENTUS mouse very well! I was scrolling my news feed on my fb and then this caught my eye. Nice height of feet. It will provide better air flow intake coming from the bottom of case. Still working on it Loving it so far though, so much room. You'll have to get those yourself. Can v51 support DVD drive with Water 3.0 Ultimate installed? Still enough space to install it? Yes, even with Water 3.0 Ultimate installed you would be able to make use of both 5.25" drive bays if need be. 1) Is it possible to change the power LED to red...? 2) If I install a Water 3.0 Extreme to the top, will there be enough space for a third 120mm fan? 3) How many fans does the case come with? 1) The LED are not included so you may choose any colour you like. 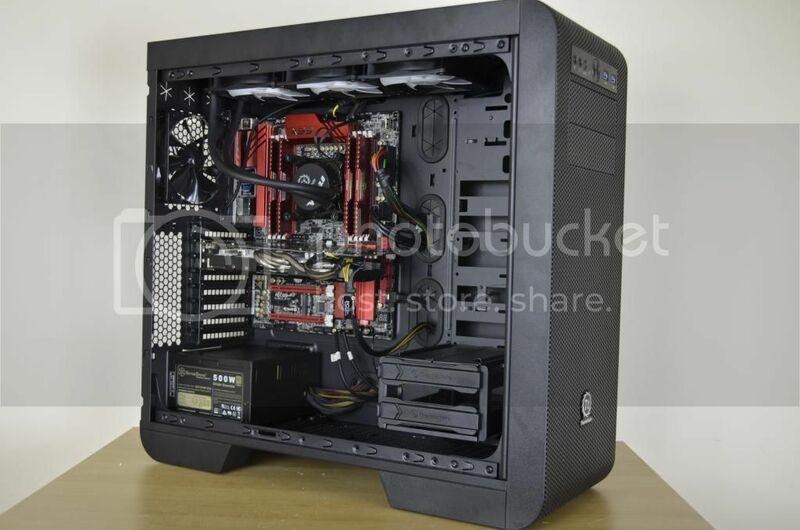 2) Yes, you have up to 420mm of room for fan and radiator configurations in the top. I have a z97 ATX MB to use. This may be a good choice. I am a happy core v51 owner, but i have one minor complaint, it sometimes vibrates too much and is noisy at the same time. Atm only a mechanical Hitachi drive, 850 Evo will be coming in soon as well as 8 gigs of G.Skill Ripjaws. Might post some pics of the build on the forum. I just purchased a Core V51 a couple of days ago from Newegg. Case is awesome! Hopefully I'll have time to move my current components over to this new case this weekend. No damage anywhere, not even the shipping box. As long as the front control panel works I'll be a happy camper. I have a question, how do you mount an SSD or HDD on the right side of the case? There is no cage there.